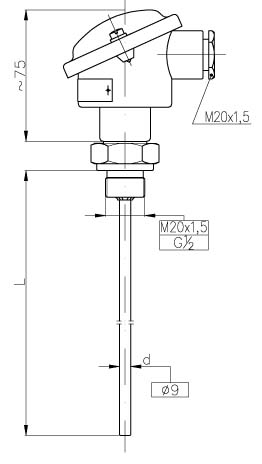 Temperature sensors type TS-11 are dedicated to measure temperature of liquids and gases from technological processes in all industrial branches. 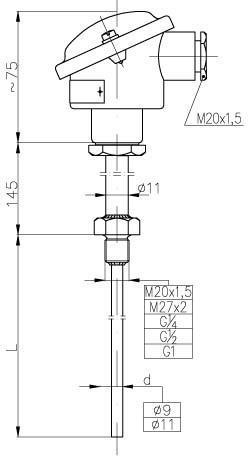 They are applicable to mount in clamp handle which allowed to set any operating length L.
Temperature sensors type TS-12 are dedicated to measure temperature of liquids and gases in technological processes installations in all industrial branches and air conditioning systems. 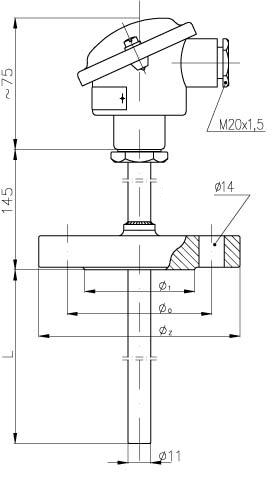 They are usually mounted in places where there is no necessity to keep a secure distance between the connection head and the fitting socket. Temperature sensors TS-13 are dedicated to measure temperature of liquids and gases in technological processes in all industrial branches. They are used in installation where, because of high temperature and thermal conductivity, there is a danger of overheating the connection head. 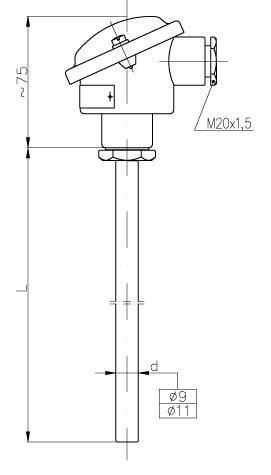 Temperature sensors TS-14 are dedicated to measure temperature of liquids and gases in industrial pipelines and pressure tanks where there is reasonable to mount them by flange.